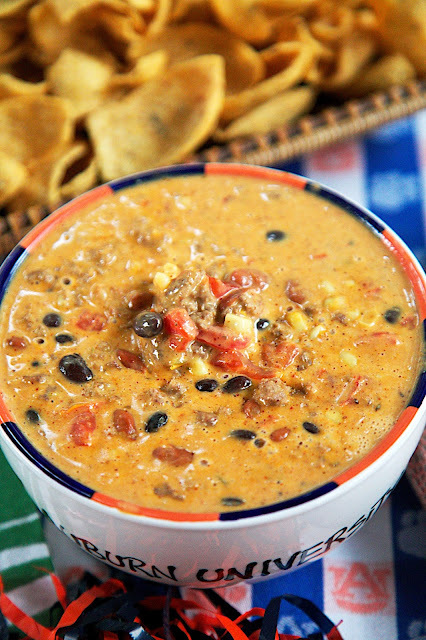 Cowboy Queso Recipe - queso dip loaded with meat, beans, Rotel and corn. Can make in the microwave or slow cooker. 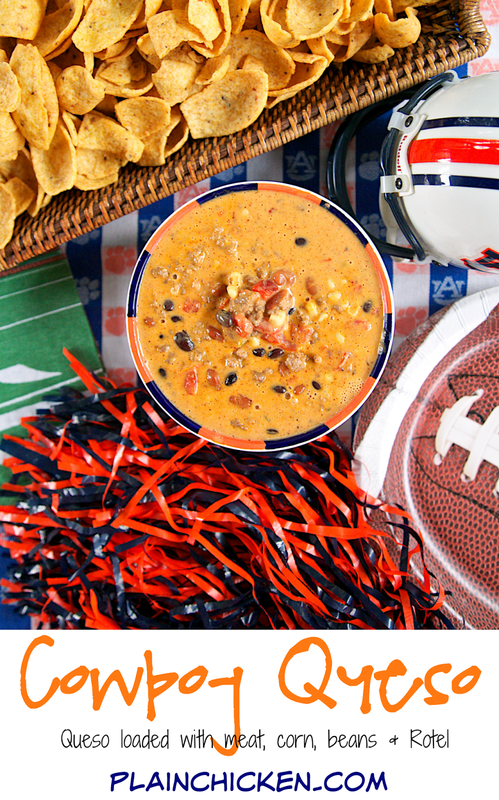 Great for tailgating!! I love this dip! We made it two weeks in a row. Would also be great served over rice. YUM! 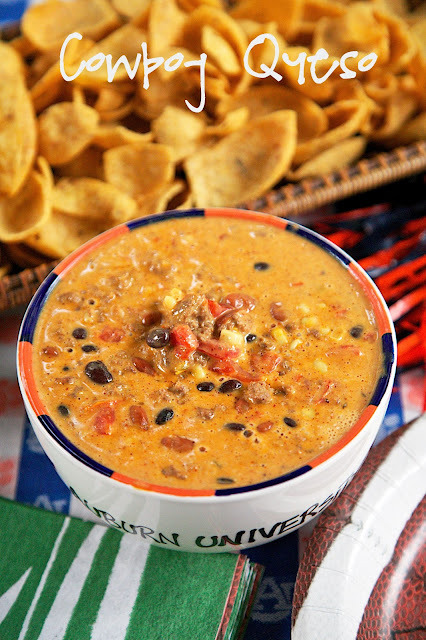 I made this Cowboy Queso for the first football game of the season. It was SO good that we made it again the next week. I seriously can't get enough of this dip! 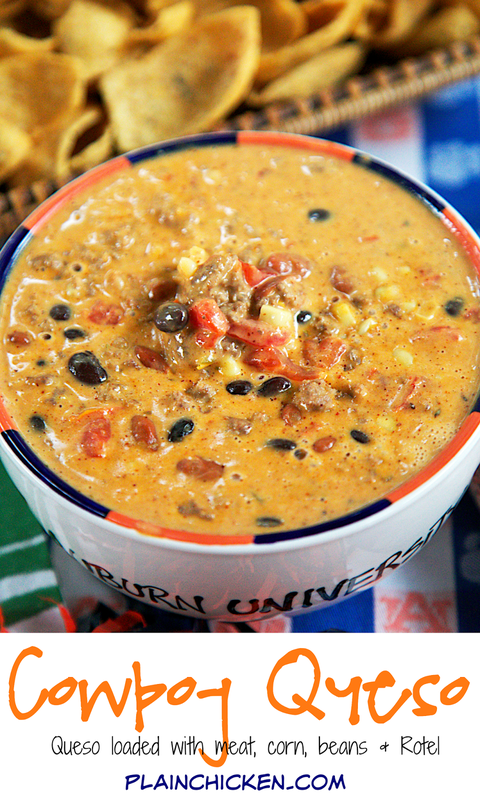 It is queso loaded with meat, beans, Rotel and corn. I could literally make a meal out of this. I think it would be great served over some rice or hot noodles. YUM! I made this dip in the microwave. I used an 8 cup glass bowl, and It took about 10 minutes to heat up. You could also throw everything into the slow cooker and let it simmer for a few hours. This is a great way to keep it warm for parties. We served the dip with a big ol' bag of Fritos. Enjoy!! Place beef in a large microwave safe bowl. Add remaining ingredients, stir. Microwave on HIGH for 4 minutes, stir. Microwave on HIGH for an additional 4 minutes, stir. Continue microwaving in 1 to 2 minute intervals until cheese is melted and dip is thoroughly heated. Serve immediately. Place cooked beef in slow cooker. Add remaining ingredients and stir. Cook on LOW for 2 or 3 hours, until cheese is melted. Serve with chips. Sounds really good Steph - just right for football. I love your site! Best recipes ever and I make your stuff all the time! Myself and all my family and friends thank you! In this picture, it looks like there are corn kernels. I do not see corn in the recipe. Am i mistaken? Your recipes look fantastic. Can't wait to make some of them!! I am so sorry....somehow I missed the corn in the recipe. Thanks! !